Accessibility is not just a simple add-on service to us – we live accessibility. We are proud to be the agency with the most “Certified Web Accessibility Experts”, certificated by Incite in Austria. With our ideas and expertise, we set new standards and enable a great user experience for handicapped persons. Continuously, our experts attend and speak at conferences. Zensations is member of the board of Accessible Media and supporter of ATAG, a symposium dealing in the field of digital accessibility. Thus, we offer this topic a large platform, that attracts hundreds of interested attendees every year. Currently our team works together with several organisations and enterprises on the introduction of a certificate for accessible web applications, which will be granted by the Austrian Computer Society from Q2 2018. This certificate facilitates a standardisation and better comparability of apps. It therefore builds the foundation for specifications made by the European Commission. What does accessible web design, also known as “accessibility” mean? An accessible website is designed to be easily accessible for everyone. Web-Accessibility is assured, when all content and information on the website is available and easily accessible for blind, partially blind and deaf people. First of all: 100% accessibility can’t be guaranteed, but we have enough experience in website creation to implement your accessible website in compliance with the Web Content Accessibility Guidelines (WCAG) 2.0. When designing websites we always focus on the strict separation of content and layout and also take care of responsive design. is oriented on 4 basic principles (perceivable, usable, comprehensible, robust), which themselves are oriented on 12 rules. Depending on the compliance rate, up to 56 (AAA) success criteria can be classified. is easily accessible on all end devices (Desktop, Tablet, Smartphone) due to responsive design. is accessible by keyboard, facilitates the use of a screen reader and offers assistive input and a line of Braille. Accessibility has an positive impact on your ranking in search engines (SEO). Increase in the number of accesses and hits on your Website – you gain higher reach if you don’t restrict your content to anyone. By the use of sustainable web development you limit the costs for further modification and changes on your website. 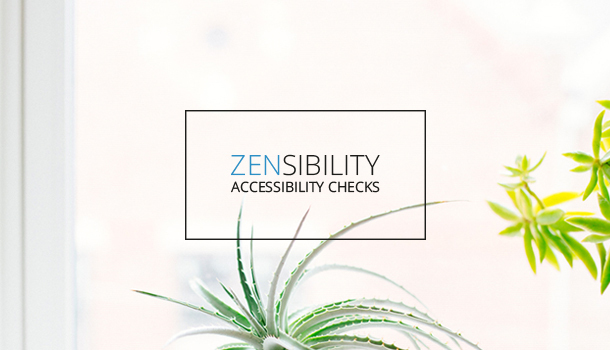 We analyse your existing website within the scope of our Zensibility Website-Check or make you an offer for the design of your accessible website. You want to train your team in the field of accessibility and learn what is essential when it comes to implementing digitally accessible solutions? We gladly generate a tailored offer for your individual accessibility workshop.